I’ve been collecting requests from my riders and this playlist incorporates three of them, plus tackles the March Challenge to use a genre of music I’ve never used before. For me, that was electro-swing. Now, I confess, a month ago, I’d never heard of it. But one of my regular riders burned me a CD and I’ve had it on heavy rotation ever since. Unfortunately, the day I used this ride, he wasn’t in class! Simple profile for this one: a mixed bag with lots of jumps (14 minutes) and a 10 minute fast seated flat at the end. Rolling in Sweet Dreams (Adele vs. Eurythmics) – Daft Beatles (3:00): Julz Arney and Lisa Goldman over at Former Cycling Pingers put me on to this great mashup, which you can find here. Time to push that tension lever until you can feel the road under your feet. Warm-up. The Paris Swing Box – Parov Stelar (5:23): Hey, if you’re gonna jump into a new genre of music, jump in! First working song of the day. Take the first minute or so (actually 0:52 till the horns kick in) to finish warming up, then we’re going to alternate a minute of surging (seated flat, 75% max capacity) with a minute in a standing climb (add some tension for the climb, then take it off to surge.) Two sets. Stelar is an Austrian DJ and musician. I got great feedback from my riders, who loved this song. Thanks to Sandy for requesting it, and for burning a CD for me. I Love It (feat. Charli XCX) – Icona Pop (2:35): Swedish DJ/electro-pop duo are storming up the charts with this ditty. Three sprint intervals 30/45/25 seconds long, all crammed into only two and a half minutes. They’re at 0:23 – 0:53, 1:08 – 1:54, 2:10 – 2:35. Lyrics include a couple of offensive words, but no f-bombs. Play Hard (feat. Ne-Yo and Akon) – David Guetta (3:21): Every once in a while, a song comes along that just seems to be perfect for cycling. I got this request a couple of weeks ago, right after the song came out and my rider is right – it’s perfect. Time for a standing climb with a couple of tension increases. I also really liked the Albert Neve Remix (6:53) which is going to find its way into an all-remix ride I’m thinking about. Scream & Shout (feat. Britney Spears) – will.i.am (4:45): Got this request from a regular, who said it never fails to make her move. I’d listened to it when it first came out and put it aside as a bit too slow, but after she requested it, I took a few more listens and decided it’s a jump song. 4 counts up/down with medium resistance, about 6/10. Same offensive lyrics as I Love It (s**t and b**ch). Go Go – Hanna Pakarinen (3:04): A big shout out to reader Sundie in Finland for putting me on to this song by the Finnish Kelly Clarkson (she won the first Finland Idol in 2004). It’s sprint perfection. 20/20/35 seconds at 0:40 – 1:02, 1:30 – 1:53, and 2:21 – 2:55. Plus, Pakarinen and I share the same birthday (April 17). Va Va Voom – Nicki Minaj (3:04): I learned my lesson with Minaj and downloaded the clean version. Remember that bit at the beginning about lots of jumps? 4 counts, resistance at 6/10. Red Hands – Walk off the Earth (3:01): A little band from Burlington, Ontario (next door to my home town), they posted a cover of Gotye’s Somebody I Used to Know on Youtube with all five of them playing the same guitar and it went viral, garnering almost 150 million views. They have many other covers on Youtube – Adele, Maroon 5, Fun., Taylor Swift, B.o.B., Eminem, LMFAO (with a side of Harlem Shake). They’re all low budget, living room productions, and they’re all brilliant. WOTE dropped their first album earlier this month, and damn, it’s good. Really good. I am home visiting my mom this weekend and I visited their website to see if they’re playing a local club or something, because it would be awesome to see them live. Yes it would, and I am not the first one to figure this out – they’re actually touring in Europe right now. All of which is by way of saying, check these guys out – you’ll be hearing a lot more from them. What? Oh yeah, we’re still riding. Seated climb for this one. Inner Ninja (feat. David Myles) – Classified (3:22): Classified is a hard-working local rapper from Halifax, NS. This is his latest (and biggest) hit. I love it for its cheekiness and the choir in the middle. More 4 count jumps, this time on a hill, with resistance at 8/10. Hey Porsche – Nelly (3:29): Critics are crapping on it, you’re not quite sure if Nelly’s crooning about a woman or a car, but it’s catchy. I’m tapping my foot as I write this. Leave the resistance at 8/10 for a standing climb up a muddy hill. Karma – Kristina Maria (2:51): Another Canadian artist, Kristina hails from Ottawa, ON. Verses are 8 count jumps, take them easy, because for each chorus, we’re going to do 4 count jumps, double-time. Sort of like a series of short standing runs. Hardest work of the day here. C’Mon – Ke$ha (3:34): Last hill of the day, let’s take it as a fast standing climb. Lyrics contain the words “screw around” but otherwise, it’s pretty tame. Throw in a couple of tension increases along the way. Bom Bom – Sam and the Womp (2:54): How can you resist a band with a name like this? These guys mix Balkan music with electronica, so not quite electro-swing but close, and definitely not something I’ve used before. Take the recovery you need, then we’re headed on a 10 minute fast seated flat with some sprint intervals coming up in later songs. Catch My Breath – Kelly Clarkson (4:12): Sprints for 30/30/60 seconds at 0:45 – 1:15, 1:48 – 2:18, 2:50 – 3:50. If You Wanna – The Vaccines (2:54): Indie, post-punk, whatever it is, this is the song that’s been going through my head since the ride. A fast seated flat with two sprints 12/50: 0:48 – 1:00 and 1:57 – 2:47. Whee! Just Give Me a Reason (feat. Nate Ruess) – P!nk (4:03): A lovely duet with Fun.’s Nate Ruess – both have such distinctive voices. P!nk sings about the relationship being in trouble and Ruess chimes in with “I’m sorry I don’t understand where this is coming from. I thought that we were fine!” which makes me smile, because there are probably a lot of men out there who’ve had that same WTF moment. Well-deserved cool down. Carry On – Fun. (4:38): I never get tired of Nate Ruess’s voice, so here’s some Fun. for stretching and good-bye music. Ah, it’s spring and everything is turning green again. In honour of St. Paddy’s Day, which is coming up on Sunday March 17, I put together a playlist of Irish and almost-Irish artists. 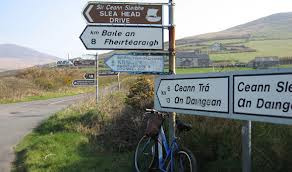 For this one, we’re going to take a ride around Ireland’s famous Dingle Peninsula, on the west coast, south of Galway, impossibly beautiful in a nation of impossible beauty. Dingle town is a rollicking place filled with pubs and the surrounding area offers massive hills, ancient stone walls, ruined castles, and frequent stops to let sheep cross the road. 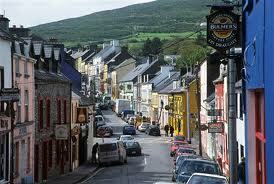 I was lucky enough to bike the Dingle peninsula on a house-swapping trip with my mom and sister in 2000. (Yep, a house swap. As in, an Irish family came to stay at my mom’s place just outside Toronto and we stayed at their place in Dublin. We even had the use of their car, although their insurer was a bit jaded and insisted we pony up $200 because apparently, North American drivers don’t have the best track record driving on the left.) While in Dublin, a cabbie told me that “Irish is a state of mind,” prompting a previous St. Patrick’s cycling mix here. As it happens, I am one-quarter Irish through my maternal grandfather, and I have the pasty skin and love of music to prove it. When I’m Up (I Can’t Get Down) – Great Big Sea (3:24): Okay, not exactly Irish but by God, if you took the west coast of Ireland and smooshed it into the closest land mass to the west, that’d be Newfoundland and Labrador, a place of Irish immigrants and strong traditions. Back in 1994, I was hiking on The Rock (as they call it) with some friends, and we popped into a record shop in St. John’s – this was back when they still had record shops. We asked the clerk who the next big band out of the province would be, and without hesitation, he said, “Great Big Sea.” They’d played their first gig less than a year before and had one CD out. We bought it. They’ve since gone on to four Platinum and six Gold albums in Canada. This is the most successful of their many songs. Let’s adjust the resistance until we can feel a flat paved road underneath our feet. Nevermind – it won’t stay flat for long. We’re riding easy through Dingletown, with its thatch-roofed homes and cheery pubs. The Boys Are Back in Town – Thin Lizzy (4:30): How am I just finding out that these guys are Irish? We’re passing the town limits. To our left is an ancient Druid cairn. The road isn’t in great condition – time for some jumps. 8 counts up and down with the music. 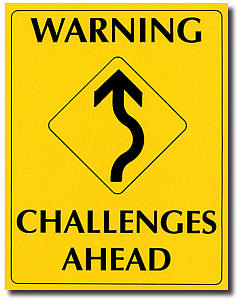 You won’t need much tension for this – maybe 4/10, they’re plenty challenging, but coach a couple of optional tension increases. I’m Shipping Up to Boston – Dropkick Murphys (2:34): Alright, you got me again, these Celtic punk rockers hail from Quincy, Massachusetts. The road evens out and gets a little better so we’re going to stretch ourselves with some speed work. Recover to 0:30 then do sprint intervals: 15 seconds on/15 seconds off. You’ll have time for four of them. Mari Mac – Great Big Sea (3:19): There I go with the Great Big Sea again. This song is tremendous fun and regularly has the audience singing the chorus, “my mother’s making me marry Mari Mac!” Recover to 0:45 and then MORE sprints, three of them, each 30 seconds long at 0:45 – 1:15, 1:45 – 2:15 and 2:45 – 3:15. Brown Eyed Girl – Van Morrison (3:03): The sun comes out over the water as we pick our way along the sharp curves that hug the coastline. There’s a panoramic view of the Atlantic Ocean to our left. Four count jumps along the rising road, resistance at 6/10 – these are almost as challenging as the previous set. Dreams – The Cranberries (4:15): We’ve got some rolling hills to climb now, ever upward. We’ll do lots of small tension tweaks – two or three upward, then down again, as we tackle this hill. Come on up out of the saddle for this one. Hey – what’s that ahead? Another group of riders. They’re recovering at the top of the hill, drinking some water, enjoying the view. Let’s try to catch up with them. The Kilburn High Road – Flogging Molly (3:43): Purists will point out that this band hails from LA, but they are Celtic punk rockers and the lead singer was born in Dublin, so that makes them Irish in my book. This song appealed to me because when I lived in London, England, I lived just off the Kilburn High Road. It’s a scrappy working neighbourhood. We catch up to the other riders and they propose a friendly race down the hill and across the valley to the base of the next, much larger, hill. The wager is a round at the pub back in Dingletown. Are you in? We’ll take the song at our race day pace, about 80-85% of maximum effort. I use visualization throughout the race with two riders in the other group leading and separate attacks to pass each of them before we get to the base of the hill. I promise everyone they can have as much time for recovery as they want or need when the song ends. Magnificent – U2 (5:24): Whew… everyone is sucking wind and water. We bid goodbye to the other riders, who are heading inland. We’re going over this hill and hugging the coast. With this song, and the next, we’ve got a 10 minute climb ahead of us, so take as much time as you need to feel ready to work again – you’re still going to get lots of hill. We’re going to take the first half of the hill seated, so let’s jack up the resistance, push back in the saddle, and go. I coach a few tension increases on the way, and caution riders that they should always be able to ride with the music. If they can’t, they have too much resistance on the bike and need to back it off. I’d have no Irish credibility at all if I didn’t include some U2 in this mix. They’re only the most famous Irish band of all-time. Whisky in the Jar – Metallica (5:05): A traditional Irish folk tune, covered by… Metallica? You bet. Thanks to Bill Thomas on Facebook for this one. It’s a relief to come out of the saddle, take the resistance back, and push to the top. Desire – U2 (2:59): It’s the top of a U2 sandwich! Now that we’ve reached the top of the hill, the road levels out to a fast, steady flat. Take this one at about 70% of your maximum effort. Those who need more recovery can take what they need and rejoin us when they’re ready. Mandinka – Sinead O’Connor (3:49): Another smaller hill to tackle here. Medium tension, out of the saddle. This song would also work for 8 or 4 count jumps if you felt like doing some more of those. Rocky Road to Dublin – Irish Descendants (5:32): This group of second-generation Irish Newfoundlanders offers one of dozens of covers of this Irish folk song that dates back to the 19th century. Time for some single-leg training: 15 seconds each leg, then 30, 45, 60 seconds with one leg doing all the work and the other coming along for the ride. Keep your feet in the cages if you’re not clipped in, and focus on making smooth circles with enough tension to make you happy when it’s time to switch legs. There’s 30 seconds for recovery here as well. You can space it out 15 seconds at the beginning and end, or however you like. The Old Black Rum – Great Big Sea (3:31): This is a perrenial pub favourite here in the Atlantic provinces, with pub-goers much prone to chiming in on the boozy chorus: “the old black rum’s got a hold on me, like a dog wrapped round my leg”. We’ve swung around on our way back to Dingletown and hit a long flat – perfect for a bit of speed. Recover to 0:38 then tackle two sprint intervals of 45 and 55 seconds at 0:38 – 1:22 and 2:20 – 3:14. We’re brought up short by a herd of sheep crossing the road. There are some other cyclists waiting, too – our friends from eariler. While we wait for the sheep to make their way across, our friends demand a rematch. Another race, this time to the town limits, double or nothing? Sure. Swagger – Flogging Molly (2:05): The whole song is a race to the finish line, 90% effort for as long as you can stand it. This time the other riders are determined to beat us, but we’re not going to let that happen, are we? The Unicorn – The Irish Rovers (3:18): Shel Silverstein wrote it but the Irish Rovers ran with it and it became their biggest hit. The group is Canadian but two of the members were born in Ireland. They had their own CBC musical variety TV show through much of the 1970s, which helped to popularize Irish folk music across the country. (We spent many an evening with the Rovers at my house.) When I told my classes that I was working on a St. Patrick’s ride for this week and asked if they had any requests, this was the one that came up. This mix needs one more song for goodbye music. I was torn: Black Velvet Band? When Irish Eyes are Smiling? Something from the Pogues? Chieftains? Riverdance? Corrs? The Script? That one’s yours… I want to finish with a big shout out to the former cycling pingers and to Chris over at Chrispins, who provided all of the great music ideas for this ride. One of my regular riders gave me a Parov Stelar CD a few weeks ago. Stelar is an Austrian DJ who does electroswing – a genre I didn’t even know existed. I popped the CD in while making dinner that night and have been playing it ever since. It’s eminently cyclable. So here is March’s Challenge: this month, use at least one song from a genre you’ve never used before. For some, that might be classic rock or country, hip hop or dubstep. Classical? Show tunes? World music? 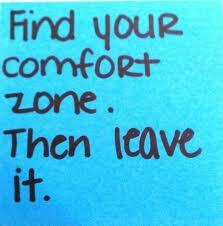 Leave your comfort zone and play something totally different. Let us know if you’re in, and report back once you’ve completed the challenge to let us know what you played and how it went over in your class(es). Me? I’m going to try electroswing.